We have seen the Mali-T400 in action on the Galaxy SII and the next generation Mali-604 still in production, ARM has announced yet another chip called the Mali-T658, which has eight cores and promises up to 10 times more better graphical performance than the current T-400 chip. The ARM Mali-T658 GPU supports a wide range of graphics and compute APIs, including Microsoft DirectX 11, Khronos OpenGL ES, OpenVG, Khronos OpenCL, Google Renderscript and Microsoft DirectCompute. 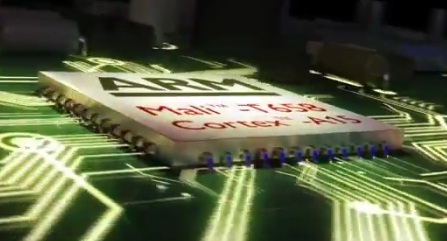 The Mali-T658 will also have 4 times more of the computing power than the current chip available and also enables nice compatibility with ARM’s ARMv8 architecture with big.LITTLE processing, which nicely allows the set to switch between chips to dynamically and achieve stunning power efficiency and performance even under strain. Even though the T-658 seems to be awesome and also manufacturers like Samsung, Fujitsu, Nufront and LG have already shown interest in it, it may not be out before 2013 when we’ll actually see the chip perform. With other companies like Qualcomm and NVIDIA continuing to develop impressive chips, for example the 12-core Tegra 3 by NVIDIA, it will be interesting to see how the Mali T-658 will succeed when it finally materializes.